Oh, I really like this building. Why can't every building look like this? Jeff and I drove up to Bodega Bay on Saturday, just to look around and get out of the city for a spell. 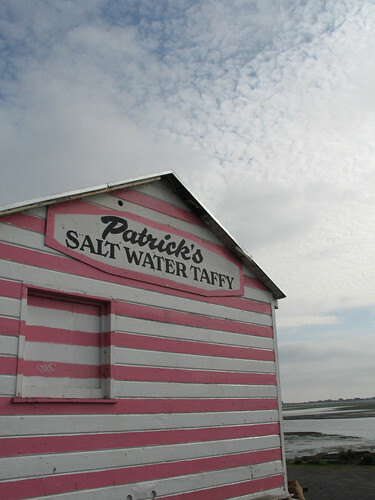 We stared at the ocean, saw (a bit of) a whale, ate at the restaurant that Tippi Hedren goes to in The Birds, and bought some salt water taffy from the place pictured above. Sometimes it's nice to take a drive through hills and trees and take deep breaths. I'm not kidding about the pink & white buildings thing. Isn't it gorgeous? Yep, another super macro photo of old toys. I can't help myself. I got these gals for cheep on ebay, apparently rubber dolls aren't really sought after. 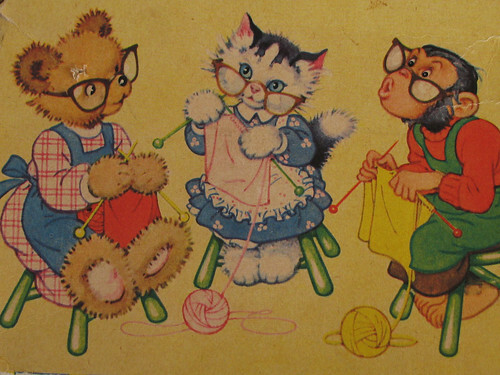 The one in the background was made by the Sun Rubber Company and was apparently designed by Ruth E. Newton, or based on her characters - she wrote and illustrated children's books in the first part of the 20th century. The one in the foreground has an incredibly somber and beautiful expression - I had the old-time ebay fever with this one. Remind me sometime to tell you about my first ebay purchase, way back in 1998... it was a Disneyland map from 1955... oh the drama. 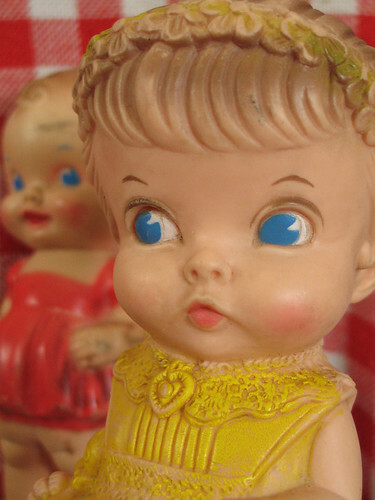 The toy with the bangs and floral garland was made by the Edward Mobley company. Both of these gals squeak when you squeeze them, and both have seen better days - but that's how I like my vintage toys, nice & loved. Thanks for all the really nice comments about my new knitted dude! I haven't come up with a name for him yet... how about Jim? I used Rowan Kid Classic to make Jim. 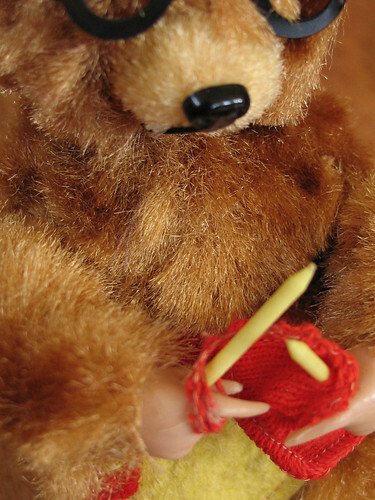 Some of the gorgeous toys in Lucinda Guy's book, Handknits for Kids were made with this yarn. I loved the fuzziness and the soft colors so I figured I should give it a try - I was kind of in a Lamb's Pride Worsted rut. And, incredibly (for me), I knitted this guy flat, so I could incorporate a face done using intarsia. I was concerned that the seam would make it flatter in the back, but that didn't happen at all. 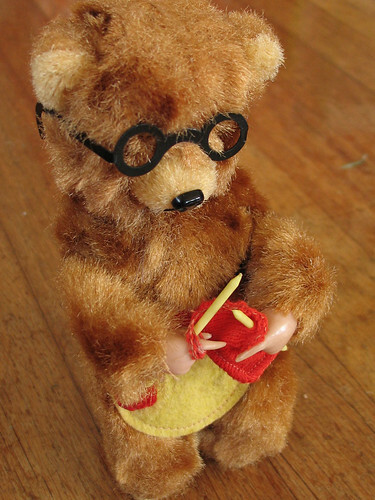 So I have all kinds of plans for intarsia-heavy toys. Fun. 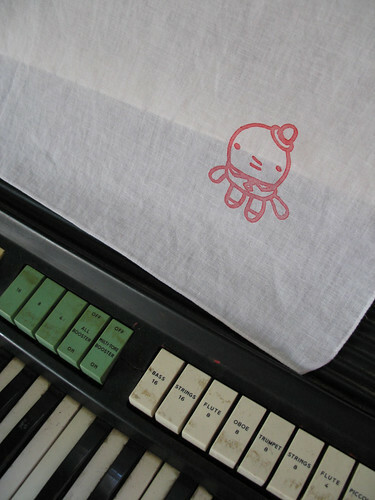 Printing on paper with the gocco was fun, so I knew using it to print on cloth would be the raddest thing ever. For the most part, I was right, and even my mistakes had some nice results. After seeing jek-a-go-go's pillowbots, I knew I had to try making toys by printing on cloth. So I grabbed some of my solid cotton fabrics, and for kicks I also pulled out some white handkerchiefs I had sitting around (as we all do, right?) and tried it out. I was impressed with the results, and after the hankies were dry, I ironed them briefly, doo dee doo dee doo, just like the instructions said, then threw them in the wash. And man, how they faded! So I took a closer look at the instructions and it said to iron them for a minute. In other words, about 6 times longer than I did! Um, whoops. But you know, the faded look on the thin white handkerchiefs is kind of cool. So at least I have a trick up my sleeve if I ever want a ghostly effect. I printed on some other fabric later, ironed the images for a minute and then washed them, and the image stayed super dark and solid. So - lesson learned - iron the heck out of those puppies. Hankies are kind of cool and dorky, don't you think? I don't use them for the usual purpose (I don't like carrying my snot around with me) but it's nice to have a piece of cloth with you, just in case. It's nice for blotting your face on a hot day, or, um, waving at departing cruise ships, or whatever. It seems kind of civilized. Especially when it has a little weird dude on it wearing a bowler hat. If you have a mo', look at the flickr photos tagged with "gocco". I love this by xtinalamb, and these by molly chicken. Lovely. By the way, Jeff got me the gocco for Christmas, and I got him a wacom tablet. I think he's getting as much fun out of his prez as I am, yes?